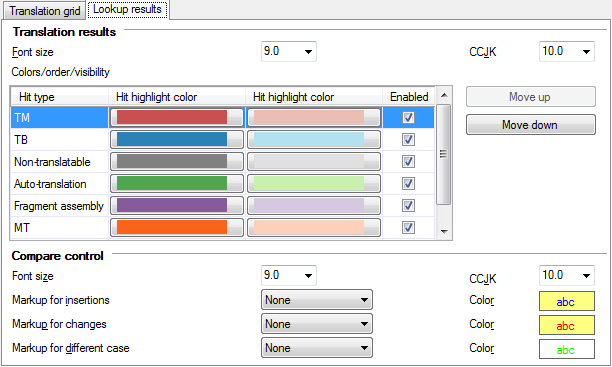 Translation Tribulations: Colors in memoQ lookup results - which termbase? A subject that comes up time and again with experienced colleagues is the desire to distinguish more easily where matches come from in memoQ. Of course, clicking on a match in the Translation Results pane of memoQ's working grid provides additional information for each type of resource (the example of the LiveDocs match has different information than one would expect to see from TM hit, a termbase match, a non-translatable or other kind of entry). But many want more obvious information in the working display and bilingual RTF exports to indicate the source of matches. In the graphic at the left, segment matches from two different translation memories and two different LiveDocs corpora are shown. There is no visual clue to indicate the differences between these corpora and TMs. One would have to click on a particular entry and look at the meta-information at the bottom right to see which data collection the hit came from, the name of the document translated, when the translation unit was created, who wrote it, etc. With termbases, however, the situation is now different. For those with excellent eyesight (I don't really qualify), there are subtle gradations of color to reflect termbase priority, the higher priority termbases showing darker colors for their hits. This is clever and useful, and unfortunately not able to be customized in a meaningful way at this time as far as I can tell. I might like to set a special match color for a termbase I want to take particular note of but which has a lower (and hard to distinguish) priority. Can you tell how many termbases are showing hits in the screenshot here? Look carefully. I find the color cues used for matches in the memoQ working window quite helpful in most cases. Although these can be customized under Tools > Options > Appearance > Lookup results, I refuse to do so, because I use these color cues to explain things to other users sometimes, and I cause enough chaos telling them to use my personal customized keyboard shortcuts based on an old version of Déjà Vu, having long forgotten what the default keyboard shortcuts are. I also don't see an easy way to reset the default colors if I mess things up. I'm grateful for the little bit of help that color differentiation in termbase results provides in recent versions of memoQ, and I hope that Kilgray takes this concept further. Similar gradations of color for TMs and LiveDocs would be helpful, and it would be very nice if custom colors could be assigned temporarily to particular resources of any type where some collections of data require special consideration. And then we need a simple way to reset those temporary color assignments. If you agree with this or have other ideas for improving the accessibility of match result information, please write to support@kilgray.com and express your thoughts. Too often users remain passive with their frustrations and thoughts about changes or additional features needed. Kilgray tends to be a very responsive solution provider, but if the user community does not express its needs clearly and consistently, it's not reasonable to expect that what we need will happen and it's even less reasonable to be annoyed when it doesn't. In the five years I have used memoQ, things have often taken time to implement, but in that time the developers and product designers have usually given careful thought to matters and mostly exceed my expectations when they do provide the solution.